In this article we detail all you need to know about the 10Bet mobile betting app including key features, compatibility and available deposit methods, as well as a step-by-step guide on how to download the 10Bet mobile app on both Android and iPhone. The 10Bet mobile sports app is available to download on both Android for users with operating system 4.0.3 and up and iPhone for users with iOS 8.0 and up. The app boasts a slick and user-friendly design and is one of very few that does not feature a bottom menu – instead everything is accessed via the side bar where you can quickly and easily access your favourite sports and events with just a couple of taps. 10Bet provide a huge range of both pre-match and In-Play markets with over 60,000 events available for you to bet on every month including over 25,000 live events. One thing we love about the 10Bet mobile app and something we believe every app should have is the ‘Bet Search’ option which makes navigating to your chosen sports, teams, leagues and markets effortless. 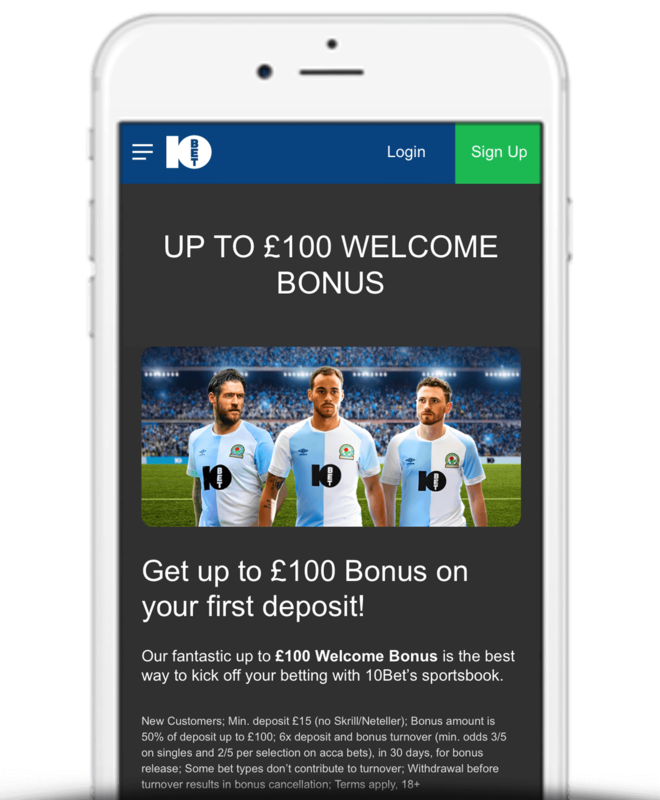 The 10Bet mobile sports app comes with a 50% welcome bonus up-to £100. Just open an account using 10Bet promo code ‘WB10BET’ and make a deposit as normal. 10Bet will then match it with a 50% bonus. You can view full details on this latest 10Bet free bet sign up offer offer as well as a step-by-step guide on how to claim. Live Streaming – Watch thousands of top-tier events across an unbeatable range of sports. Cash Out & Partial Cash Out – Cash out early before an event has finished or use the slider to choose the amount you wish to withdraw. Rewards & Updates – Custom-tailored to your personal preferences. Promotions – Regular deposit bonuses, free bets, enhanced odds and cashback offers. Payouts – Immediate bet settlement. Banking – Extensive range of fast and secure deposit and withdrawal methods. The table below displays the minimum software requirements in order for you to be able to download the 10Bet mobile Android and iPhone app. The table below features deposit methods that are currently available via both 10Bet mobile Android and iPhone apps. Click here to head to the 10Bet app page on the Google Play Store. Click here to head to the 10Bet app page on the App Store. At the time of writing, the 10Bet mobile app boasts a poor average rating of 2.1 stars on the Google Play Store however it must be noted only three people have left a review. On the Apple App Store, the app is yet to be assigned an average rating. When we took a look at the very small number of reviews that had been left, a handful of users noted they were experiencing crashes while others were disappointed with the welcome bonus. Of course, due to the lack of reviews, it’s difficult to get a genuine feel for what users think. We will continue to monitor both platforms and update the above once there is more data to go on. The 10Bet mobile app, which is available to download directly from the Google Play store for Android users and the App Store for iPhone users, is well worth considering – if not for their superb £100 welcome bonus then instead for the application’s intuitive design and ease of use which provides a great overall betting experience.